A NJ back yard featuring a swimming pool and natural stone patio. The chaise lounge chairs are facing the pool and a three tier waterfall. I used natural stone for the pool steps and added some carefully placed boulders into the pool coping. 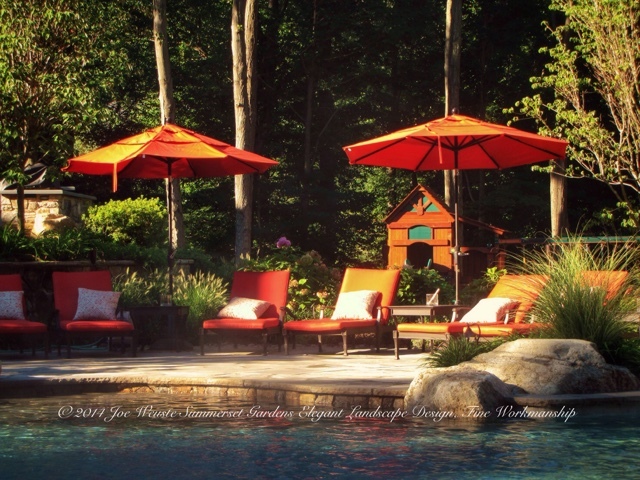 I used Hydrangea, Ornamental Grasses and a variety of perennials around the pool patio. To the left you can catch a glimpse of a midlevel terrace with an outdoor kitchen. Tucked to the rear of the property is playset with a white picket fence.